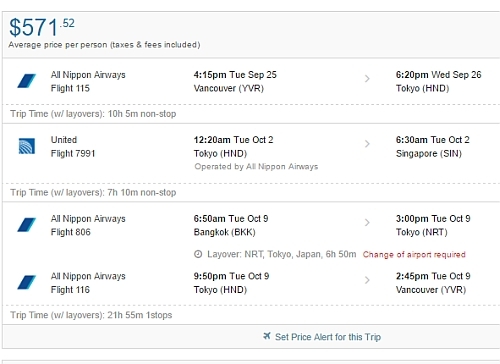 Related to the recent deals to Thailand, ANA is showing open jaw flights where you fly from Vancouver to Singapore, and then home from Bangkok, Thailand to Vancouver - for a total price of $458 to $481 including taxes. - the trip length doesn't have to be 2 weeks, it can be longer or shorter. - try starting with Tuesday to Tuesday dates. Once you find a cheap one, you can try dates nearby. I would focus on Monday, Tuesday, Wednesday, and Thursday dates. - For the first and third flights, try using dates from the list for regular roundtrip flights, above. - Play around with the middle date to give yourself more or less time in Japan vs SE Asia. NOTE: The flights between Singapore and Bangkok are not included. 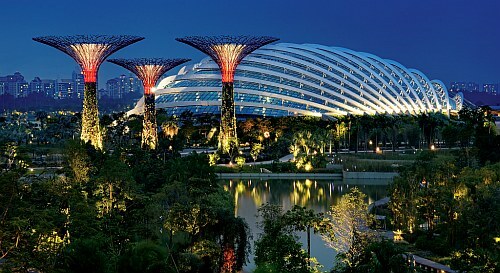 You need to book a separate one-way flight between Singapore and Bangkok. It normally costs around $50-60 CAD for a one way flight, on airlines such as Air Asia, JetStar, or Scoot. - For the first and last flights, try using dates from the list of regular roundtrip flights at the top of this blog post. - Play around with the dates of the 2 flights in the middle. 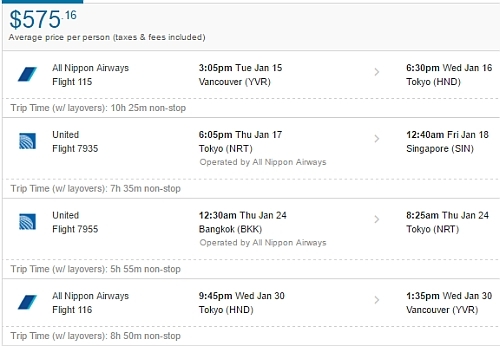 vancouver, yvr, flight deals, asia, east asia, bangkok, thailand, bkk, ana, all nippon airways, singapore and sin. 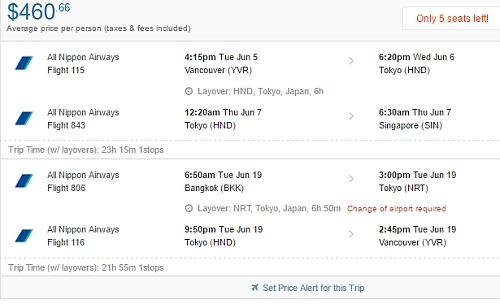 4 Responses to "Vancouver to Singapore, and then Bangkok, Thailand to Vancouver - $458 to $499 including taxes | add Japan for $100"
Is there an option to skip Bankok and focus between vancouver and singapore/tokyo then back to Van? I am also wondering about that as well ^! how tough is it to switch airports in Tokyo? on my return we need to change airports to HND from HRT?